Keisha only needs the blankie – not the monkey. Her post is from a couple of years ago, but she’s written to say she is still hoping to find the blankie. And now it’s been FOUND!!! She writes: Thank you so much for your time and this wonderful site. I will continue to check back in hopes if helping someone else. I am a distraught mom at this time. I lost my son’s blankie this past week while out on our walk. I have back tracked several times a day with no luck. I contacted the manufacturer with no luck, as it is discontinued. My son is not taking this well. He has not had a full night’s sleep since it has been gone. He has autism and does not do well with change, and this is a HUGE change for him! He has slept with his blanket every night since he was born. He also drags it everywhere he goes. 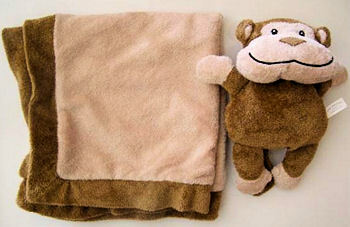 It’s an Animal Adventure LullaBuddies 20×20 light brown micro fleece blankie, with a darker trim around the edge. It had a monkey attached to it when I got it, but I cut it off. All I need is the blankie. I really don’t know what to do. Any help is appreciated even if just a website for me to look for item like these. I have looked with no luck. who is the manufacturer you contacted? where did you buy it? Is the blanket pictured the one you are looking for. You said dark brown, with darker trim. Was the monkey in the center or edge of blanket? Did it have arms and a tail. What color was the monkey? Did it rattle? How old is the blanket? Thanks for the info, it will help in the hunt. does the other side of the blanket look the same as this side? I added a link to the photo that has the monkey in it to the post. Also, it’s spelled Lullabuddies, all one word. i’m still looking for this if anyone has any information. i’m still looking for this if anyone has seen one. Thank u thank u thank u I was on eBay looking yesterday with no luck. Just bought whoever found this is awesome. My son is going to be thrilled this blanket had been on a 2 year trip. I thought he would of gotten over it but he carries a picture of it around now instead. I can’t wait to see his face when it comes in the mail. Thanks so much..
Hi Keisha. I am so glad you were able to get to it in time. It was a pleasure to be able to help you out. For some reason I have been very lucky finding things on eBay for people lately. I hope your son loves this blanket as much as his first! It’s so nice to see a happy ending! Yes it IS, Anji! We’ve had a run of successful finds lately. Very satisfying. Want more blog traffic, find lots of interesting blogs and people? Try free ExposeYourBlog.